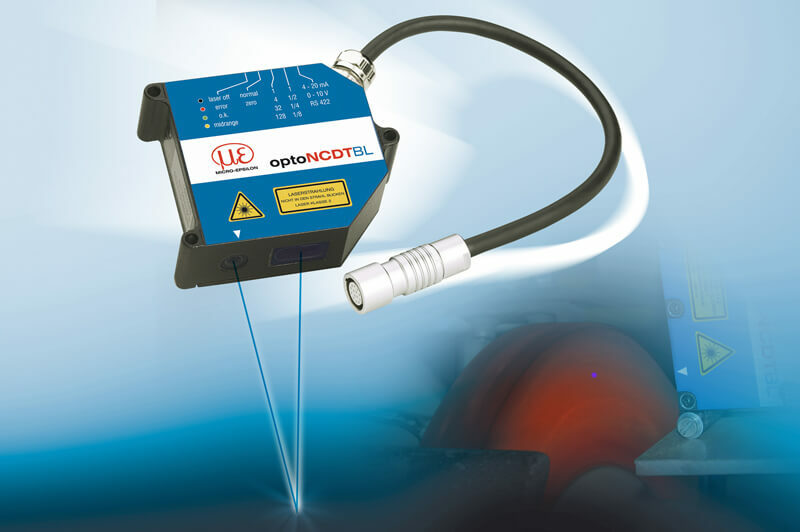 With more than 380 laser triangulation sensor versions available from stock, Micro-Epsilon’s optoNCDT laser triangulation portfolio for displacement, distance and position measurement is the widest range available worldwide. The product portfolio is categorised into entry-level, mid-range and high-performance sensor series. 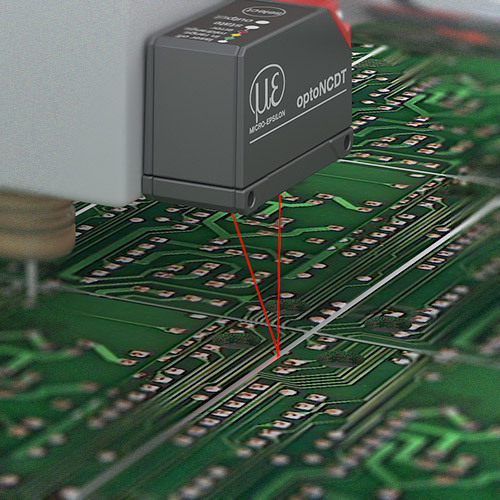 At each performance level, Micro-Epsilon laser sensors are all of high quality, offer a very competitive pricing structure and often much higher measurement performance than other comparable laser sensors on the market. The technical litreature can be downloaded here which summarises the key performance features of each sensor series. The high performance optoNCDT sensor series are market leading in terms of speed, resolution and linearity. Our sensors not only offer high performance on ideal targets in a test bench environment, but also in high speed, in-process measurements on almost all surfaces even without averaging. All sensors are designed for industrial applications. Packaged in a robust metal housing, providing protection from shock and vibration. Integrated controllers mean a much simpler installation in a more compact footprint. All sensors are IP65 rated as standard, with IP69K rated versions for food and beverage wash down requirements. Air and water cooled enclosures are also offered for high ambient temperature environments. Due to the construction, excellent temperature stability is achieved, resulting in more accurate measurements in changing temperature conditions. An intuitive web interface allows direct connection to the sensor using its IP address. This simple connection enables quick and easy sensor setup. For the optoNCDT1420 series, the interface even has pre-defined sensor configurations for the most common surface types, for example “transparent”, “translucent” and “opaque”, ensuring optimum sensor configuration. 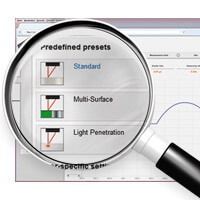 To achieve the highest performance in dynamic measurements, SMART pre-defined functions have been created. Functions include viewing and outputting of the video signal display, selection of individual signal peaks and ROI (region of interest). These functions allow interference signals from outside the "measurement area" to be filtered out. 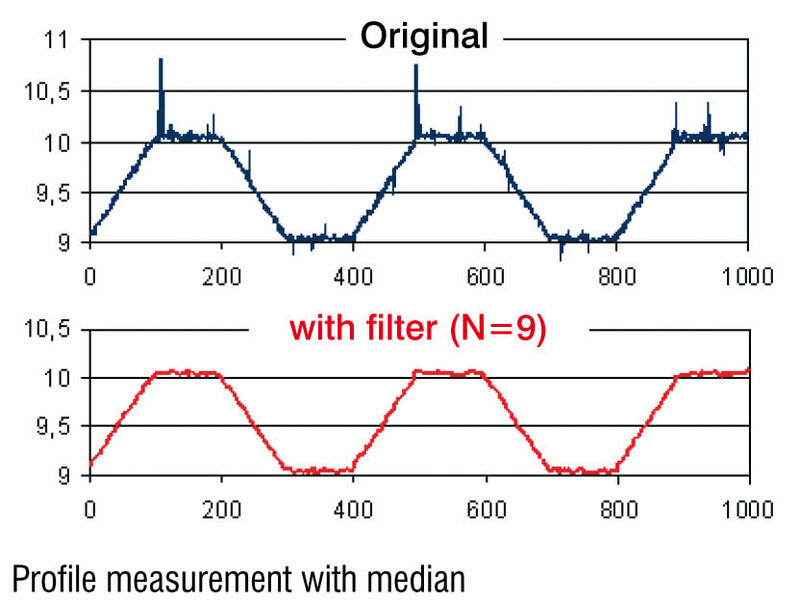 Advanced filters such as A-RTSC (Advanced real time surface compensation), median, recursive, mean and "spike correction" ensure errors due to changes in surface colour, texture or geometry are reduced to a minimum. All sensors have multiple output versions; volts, current, serial RS422 and external triggering. The high performance series has Ethernet and EtherCAT interfaces. For many applications, it is necessary to measure or acquire data simultaneously using 2 or more sensors. The optoNCDT series has been designed to ensure both optimum performance and easy integration. By using key features such as "true synchronous" errors in thickness measurement in dynamic applications is prevented. 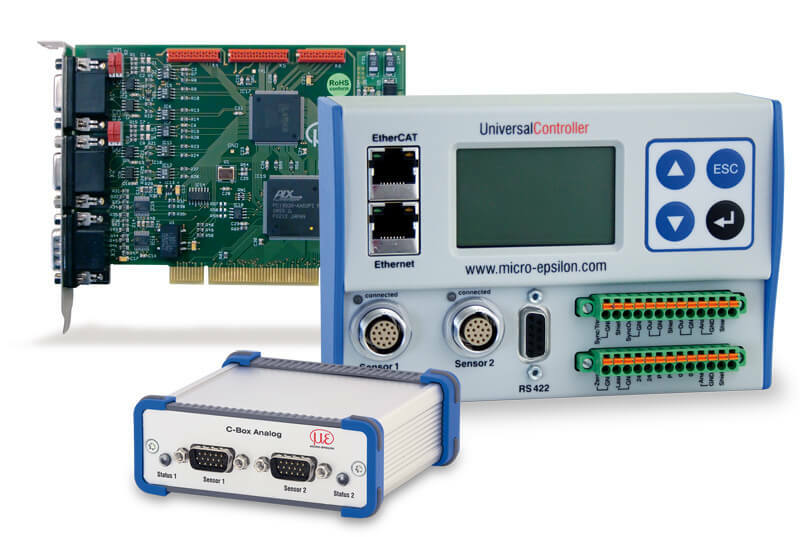 A complete range of external programmable controllers, PC interface cards and cables for PLC’s can be supplied along with a complete SDK library for C++ and LabVIEW integration. Conventional red laser diodes can find it difficult to measure accurately on surfaces such as highly polished metals, plastics, paper, silicon and organic materials such as skin. 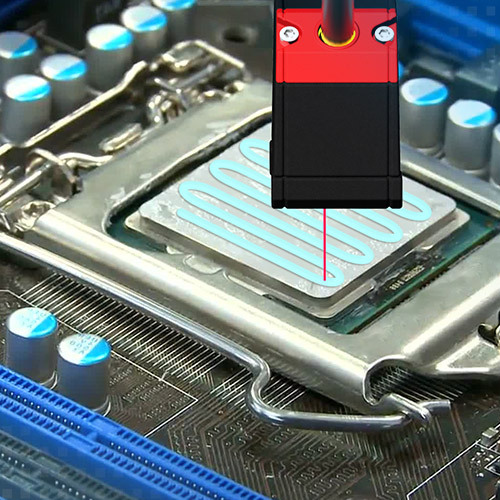 Due to the shorter wavelength of blue laser and the diode having a lower intensity, the Blue Laser sensors series provide a stable and accurate measurement. In addition blue laser is the only method to accurately measure hot, glowing materials and silicon blue laser series. Requirements can occur where the standard versions of the sensors are performing at their limits or cannot be packaged into the application. 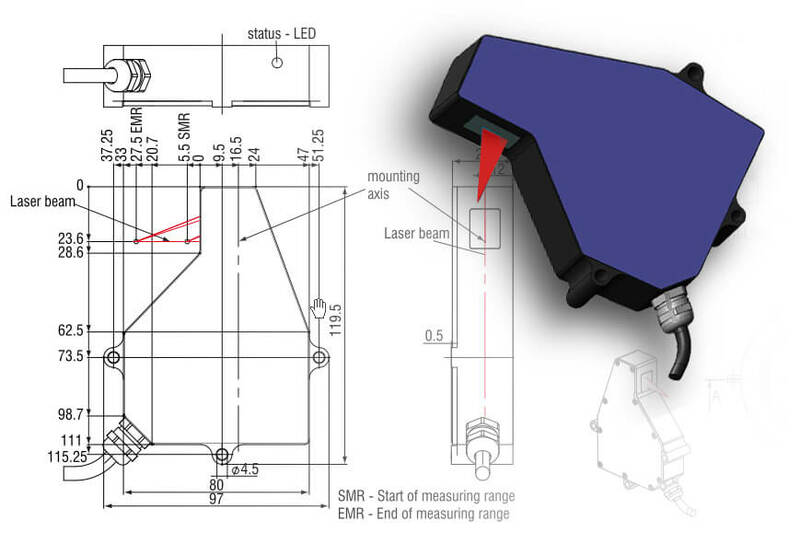 In these instances, the laser sensors can be adapted according to customer specific requirements. Typical change requests include, modified sensor geometry, specific measurement ranges, special target calibration and modified cable lengths. For high volume applications, Micro-Epsilon is able to offer a bespoke design service to meet specific performance requirements. To discuss this with Micro-Epsilon, call +44(0)151 355 6070 or click here to email us.